While a tongue tie in babies is not a serious condition, it comes with its fair share of complications including the inability to breastfeed. Have you been painfully trying to breastfeed your newborn? Is he having trouble latching? Then you might want to get him checked for a tongue tie. A tongue tie or ankyloglossia, is a condition where a short thick tissue connects the bottom of a tongue’s tip to the floor of the mouth. This restricts the movement of the tongue, making it difficult for a baby to stick his tongue out, breastfeed, swallow or sometimes even vocalise. While a tongue tie is not a serious condition and can be corrected with a small surgical procedure, you will first have to identify it. A doctor may check your baby’s tongue for movement and structure, as well as its appearance. All this can be done in a physical examination. But why do babies suffer from this condition? Typically, the lingual frenulum (the short thick tissue) separates itself from the tongue before birth. This allows the tongue a free movement and larger range. However, in some babies the lingual frenulum remains attached to the tongue, thereby, restricting free movement. Why this happens remains largely unsolved, but it could be a result of genetics. And the condition could have its fair share of complications, especially if it is left untreated. A tongue can largely affect a baby’s speech, breastfeeding patterns and overall dental development. But there are more issues that tag along with this condition. Difficulty in speech: If left untreated, a tongue tie can also interfere in your child’s speech development. For instance, he may be unable to make sounds that start with ‘z,’ ‘s,’ ‘d,’ ‘th,’ and even ‘I.’ He may also be unable to roll his tongue to clearly pronounce the word ‘r’. Poor oral hygiene: For a child born with a tongue tie, cleaning the lower gum can be quite difficult. This can ultimately lead to collection of germs, tooth decay and sometimes even gingivitis (inflammation of gums). A tongue tie can also lead to a gap between the two lower front teeth. Restriction of movement: Apart from the two aforesaid complications, a child with a tongue tie may also feel restricted in activities such as licking (food or even his lips), kissing or even playing a wind instrument. As mentioned before, while a tongue tie is not necessarily a serious condition, it can be corrected through a small surgical procedure. A treatment may not be necessary for a baby who has a tongue tie but can feed with ease. Sometimes doctors carry out the surgical procedure before the newborn is discharged and sometimes they wait for the tissue to loosen up on its own. But, if your baby is unable to latch on or his feed is getting affected, your doctor may recommend any of the two tongue tie division procedures, based on the level of complication. Frenotomy: In this procedure, the thick and short (lingual frenulum) that connects the tongue to the floor of the mouth is cut. It is usually pain-free and may or may not involve local anesthesia. The doctor may examine the lingual frenulum and then use a numbing medicine in that area. Then, using a sterile scissors, he may cut it from the middle. This procedure is usually quick and mostly blood-free since there are fewer nerve endings and blood vessels in that area. Frenuloplasty: This is another procedure that is carried out if the frenulum is too thick and needs or if any additional repair to the area is required. It is usually performed under anesthesia using sterile surgical tools. After the frenulum is cut, the wound is closed with dissolvable sutures. Post the treatment, tongue exercises maybe recommended so the child gets used to the free movement. As with any medical procedure, the risks are the same for Frenotomy as well as Frenuloplasty. The foot of the mouth could get infected, there can be excessive bleeding, or the tongue or salivary glands may be damaged. Therefore, you should be prepared before fixing up the doctor’s appointment. Here are a few things you can do on your own before opting for the surgical procedure. Prepare a set of questions for the doctor before the consultancy. You can ask about the severity of the condition, requirement of the surgical procedure and the risks therewith. You can also ask if the procedure can be done at home or in a hospital as well as the care post the treatment. And finally, you must also know if your baby would also need the care and attention of an ear, nose and throat specialist. This way, you know exactly what are going in for and also what to do after the treatment. The important thing to remember here is that you should first speak with your doctor to know if they think your baby has this condition. And if you get a go ahead from them, refer your baby to a specialist. 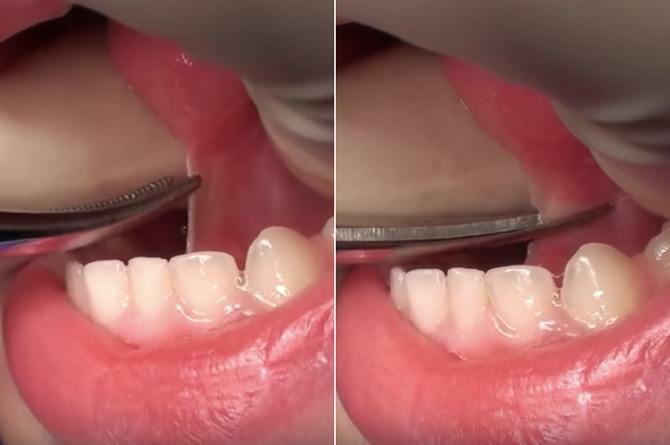 Take a look at this video to get a better understanding of what happens during a tongue tie division treatment.